At a staff meeting about five years back, our principal had us look at the previous year's test results, identify one or two areas of weakness, and then write a plan of action for improving that weak strand. Well, my colleagues and I recognized that Author's Purpose was a weak area for our third and fourth graders that year. 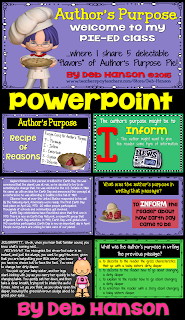 We wrote what we thought was a fabulous plan to help our students to better understand the concept of Author's Purpose... and thus be better equipped to score higher in that area on the annual standardized tests. 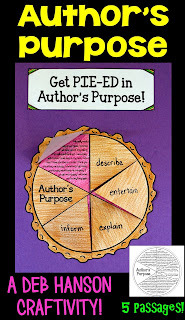 Our plan even included placement of a huge "pie" in the central part of the hallway where each class wrote the titles of books they had read that fit into each category! As teachers, our confidence soared as State Assessment time approached! (You know what's coming...) Well, assessment time arrived, and as an ESL teacher, I was providing the accommodations of reading the test questions aloud to limited-English proficient students. 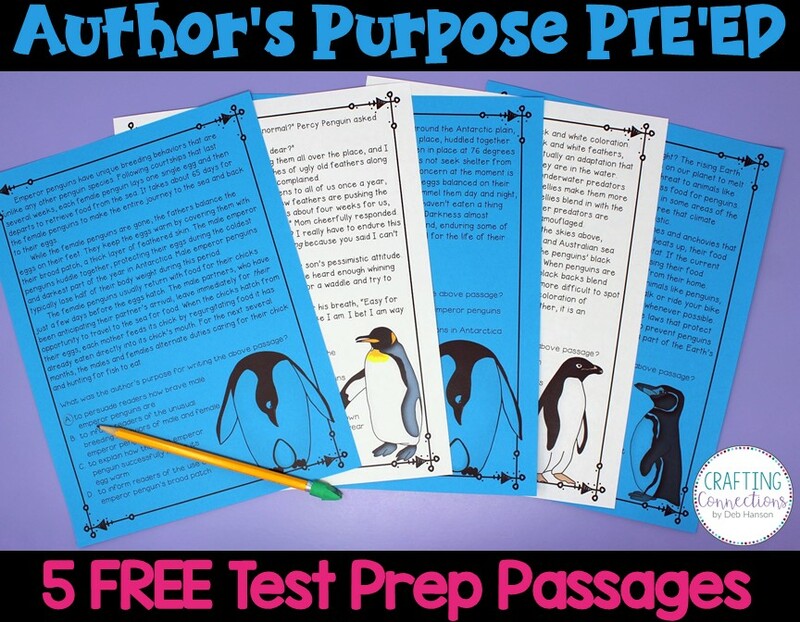 I got a sinking feeling in my stomach as I read various questions related to Author's Purpose. I realized that the test authors did not limit the answer choices to persuade, inform, and entertain. Rather, I saw answer choices that included words like explain, describe, and occasionally even illustrate. 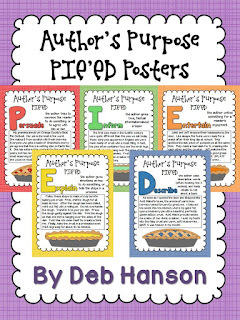 It was then that I set out to do more than just teach the basic PIE method for Author's Purpose! 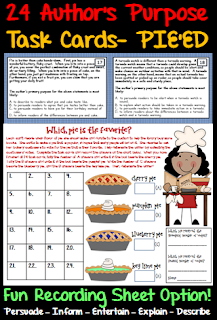 I found the PIE'ED method online, and from there created several materials to support that method. 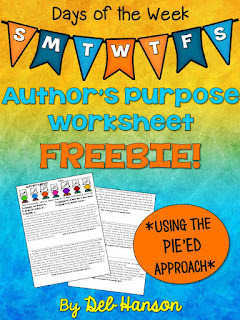 The following three items below are FREE in my TpT store for any teacher who might want to try teaching this method to their students (just click on the images)! I also have several other items available. Feel free to check them out! Thank you for making these resources! I knew there had to be more out there than just PIE! I created a PowerPoint for my school using PIE'ED. 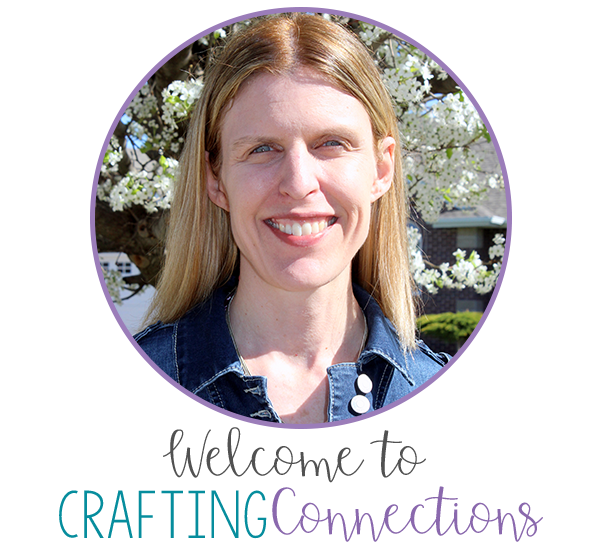 I plan on placing a link to this blog and your resources in the notes section of my powerpoint for other teachers in my school to find. I can't wait to print out the posters!